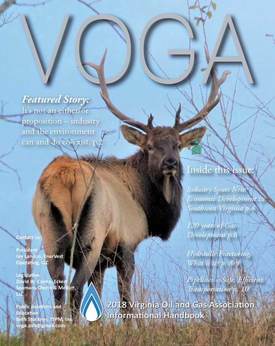 The Virginia Oil and Gas Association (VOGA) has released its 2018 Information Guide and website which provides insight into the oil and gas industry in Virginia, focusing on environmental stewardship,economic impact, pipelines, natural gas uses, fracking and other benefits the industry has brought to the state through cooperative ventures with others. Leon Boyd, a member of the Virginia Department of Game and Inland Fisheries board, as well as the Rocky Mountain Elk Foundation board and the Southwest Virginia Sportsmen’s Club, talks about the elk restoration project in Buchanan County, Va., and how work with the industry continues to make it successful. Two studies point out the economic impact the industry has in Virginia in the way of taxes paid and jobs created. Dickenson County officials, who are located in one of the Southwest counties where gas is produced in the state talk about how vital the industry is to that county’s future economic development, as well as how it currently offers job opportunities and tax revenues which provide funding for roads, water and sewer projects, and schools – something they refer to as critical infrastructure pieces to any stable and/or growing economy. Shawn Lindsey, Southwest Regional Recreation Authority executive director, talks about how the gas industry’s willingness to work with Spearhead Trails has increased tourism potential in Southwest Virginia and positively impacted the region and the state tourism economy. With the help of its gas partners, he says, Spearhead Trails has been able to build more than 400 miles of trails in the last four years and it is expected with their support, that growth will continue with more than 100 miles of new trails added per year for several years to come. Misconceptions related to hydraulic fracturing, or “fracking,” are addressed and it is noted modern hydraulic fracturing is a safe and proven process which has been around since 1947. Since that time, nearly three million frac treatments have taken place. It is also noted that up to 90 percent of all wells drilled in the United States are hydraulically fractured each year with no scientific data indicating harm to groundwater from this process.. Producing natural gas and coalbed methane gas wells in the Commonwealth numbered 8,154 in 2016. All of the wells are located in Southwest Virginia, where Buchanan County remains as the largest gas producing county in the state, followed by Dickenson County. The safety and efficiency of natural gas and liquid pipelines and the fact they are a critical component of Virginia’s energy infrastructure is addressed. It is noted the infrastructure in place is both proven and safe as a method to transport energy across not only the Commonwealth, but across the country as well. Natural gas as a building block of everyday life is the topic of another article. It is noted that not only does natural gas heat our homes, provide a fuel source for cooking, or fuel for our vehicles, but it is also an important feedstock for many other items we use each day. Copies of the 2018 VOGA Information Guide are available by contacting Stockner at voga.pub@gmail.com. Additional information about the industry may also be found on its newly designed websites www.vaoilandgas.com and www.vanatgasfacts.com.